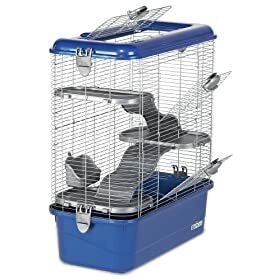 Interacting with your small animal is safe and effortless with the Super Pet Habitat Defined Rat Habitat. The next generation of small-animal habitats offers multiple play levels for a fun-filled climbing experience. Made using strong plastic protected by Super Protect antimicrobial technology that provides a healthy, clean environment, as well as sturdy metal wire with 1-inch spacing. The fully opening top door, rounded corners, and extra-deep base design offer effortless cleaning. All doors feature spring-loaded locks to ensure your pet’s security. Includes 3 Extra Fun Wavy Ramps, 3 Elite Comfort Shelves, sturdy latches, and locking food dish. Easy assembly. Sized for rats. Measures 25.25 x 12.25 x 28.25 inches. The next generation of small animal habitats. Habitat defined homes make interacting with your pet safe and effortless. Multiple levels of play offer your pet rats a fun-filled climbing experience.